Yet another motherboard from Shuttle that sounds like it should be a car... I mean with a name like AV45GTR who wouldn't think of some wicked little roadster? 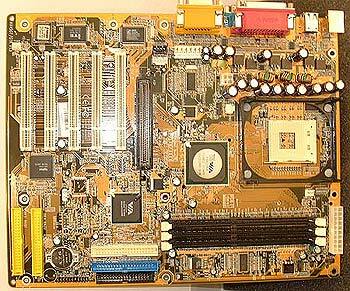 Today, we're going to be look at Shuttle's AV45GTR, a P4 motherboard based on the controversial P4X266A. Intel had claimed they did not licence VIA Technologies to build a P4 chipset, however VIA bought up S3 who did have a license for the P4 so they felt they didn't need get anther one from Intel. Intel took VIA to court over the matter, and now the two companies aren't exactly friendly. When the Pentium 4's were first released, they only worked with RDRAM which was very expensive. 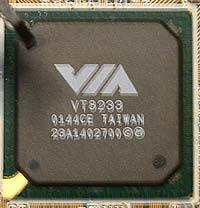 Intel later released the i845 chipset which allowed P4's to be used with SDRAM, but SDRAM just didn't have enough memory bandwidth to keep the P4 happy. Eventually DDR was introduced as an alternative. DDR has twice the bandwidth of SDRAM, but not as much as RDRAM. The trade off comes in price, as DDR is quite a bit cheaper than RDRAM. SDRAM/DDR RAM has shot up over 100% in price over the last few months and now the price of DDR and RDRAM is about the same. 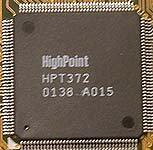 Now a days there are quite a few DDR chipsets available for the P4 - from Intel's own i845-D (DDR 266) to SiS's 645 (DDR 333) and ALi's ALLADiN-P4 (DDR 333). The layout of the AV45GTR is pretty clean, the ATX power connector is up at the top of the board so it doesn't get in the way of anything, however the P4 connector and the Aux. power connector are on the other side of the board, which isn't that great especially with those cables hanging over the CPU socket. One 4x AGP, five PCI's and three DIMM slots are pretty much standard equipment these days, it also has on board Hardware 5.1 audio care of the C-Media 8738 and on board Ultra/133 RAID controller using the Highpoint HPT372. 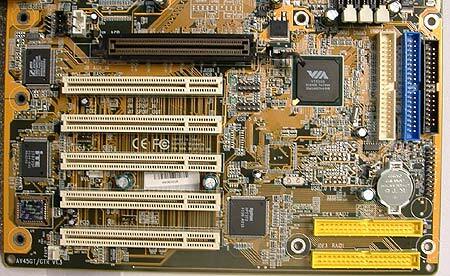 We were a little disappointed that the board had no free fan headers after installing the CPU heatsink. 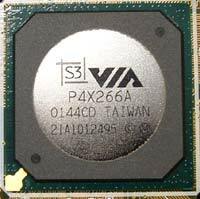 As mentioned above, the P4X266A is basically the P4X266 with the same improved memory controller found in the KT266A Athlon chipset. With the competition having faster chip sets, VIA felt the pressure to release a new revision of the P4X266 in order to keep up to speed. It supports up to 3GB of PACE/2100 DDR RAM. The VT8233 southfield is basically a tweaked version of their notorious 686B. The VT8233 supports Ultra/100 hard drives, 4 USB 1.1 ports and has both the VIA AC'97 codec integrated as well as the modem MAC codec. It was nice to see that even though the VIA VT8233 southbridge has integrated audio, that Shuttle decided to use the C-Media 8738 5.1 as a sound card which has about the same audio quality as the SB Live! 5.1. We didn't experience any problems when watching DVD's or playing our favorite games in the office, RTCW and MOHAA. The AK45GTR also has an IDE RAID controller that uses the HighPoint HPT372 chipset which allows for up to two IDE channels supporting RAID's 0, 1 and 0+1. RAID 0 is not considered a true RAID since, there's no data redundancy. What it does is take two drives of the same size/configuration and stripes them. Meaning it makes one big drive out of two smaller ones. This improves performance by cutting hard drive latency in 1/2 since the data is divided equally and written on the two hard drives. This also has the added effect of increasing data bandwidth by two. The reason it's not considered a RAID is because if one drive fails, all data is lost. RAID 1 mirrors two drives of the same size. In theory, if one drive fails, the other will take over as the primary hard drive and the system will operate as normal. This is what is supposed to happen with a SCSI hard drive setup and it actually works pretty well here. However IDE doesn't like devices that are unstable and the system will usually crash if there is a fatal error with one drive. Since the data has been written on the other drive, all is not lost however. With RAID 0+1, you need four hard drives of the same configuration/size. What RAID 0+1 does is stripes two sets of two hard drives, one set for a RAID 0 configuration and the other for RAID 1. What this does is offer the best of both worlds, the high performance of RAID 0, with 100% data redundancy of RAID 1. Hence the name RAID 0+1. The only downside would be the need for four identical hard drives.